Robert Vos Carat (SWB born 2000 by Cardento out of Tiffany 20283 by Krevad-Falstaff, breeder Bengt Wallin) has passed away at the age of 18. With Robert Vos in the saddle, Carat placed 3d in 1.50, Das Championat der SIGNAL IDUNA at CSI**** Dortmund last weekend. 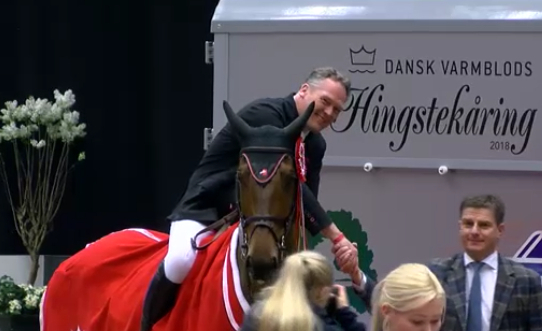 2018 they won 1.50 in Neumünster, Braunschweig and Herning. 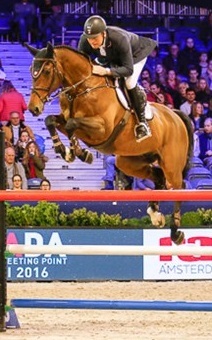 Carat is one of the horses that contributed most to SWB's successes on the various ranking lists. Petra Aittola trained Carat in Sweden. Vos and Carat began competing internationally in 2011. Vos and Carat were often called "The Flying Dutchman on Europe's Fastest Horse". Carat suffered a colic and his life could not be saved. Robert Vos writes on Facebook: "Thank You CARAT !!!! You were the BEST !!! Had so many great years with you. You always gave everything and deserved a super retirement but you kept on jumping... like a SUPERSTAR , the older the better... You will always stay in our memories. RIP CARAT ". Robert Vos and Carat (SWB). Wallin family have a few offsprings from a sister to Carat, Imelda Marco 23553. Read more about Carat´s marefamily >>.